Abu Dhabi and Dubai: Coinciding with the World Mental Health Day, which falls on October 10th every year, Zayed University held a one-day event in both Abu Dhabi and Dubai campuses under the theme “Stop the Stigma of Mental Illness,” to raise mental health awareness. Organized by the Student Counseling Center, the event was inaugurated by Professor Reyadh AlMehaideb, Vice President of Zayed University, Dr Fatima AlDarmaki, Assistant Provost for Student Affairs, and Dr Kuldhir Bhati, Director of Student Counseling Center, to enlighten students about mental health and the devastating effects of its stigma and stereotypes. The Student Counseling Center aims to provide psychological first aid and support to Zayed University students in order to ensure their psychological and health wellbeing. It provides a wide range of services including individual and group counseling, consultation, outreach programs, psycho-educational workshops, crisis intervention, and referrals to off-campus resources. A team of dedicated and committed counselors provide professional services in a confidential, trusting, safe and supportive environment towards helping students overcome the psychological distress that interferes with their academic performance. Several posters on mental health disorders were placed in various locations across campuses and meant to create conversation around mental health. Professor AlMehaideb has exchanged dialogues with Mariam Al Shamsi, a senior student who studied psychology at Zayed University and a current intern at the Abu Dhabi Health Authority (HAAD), who introduced ideas displayed in the format of effective poster design. Posters discussed some mental health disorders such as, Obsessive-Compulsive Disorder (OCD), anxiety as well as artists, musicians, and actresses, who were diagnosed with mental illness including: Kurt Cobain, Georgia O’Keeffe, Jackson Pollock, and Robin Williams. Dr Fatima has also pointed out that Zayed University is always keen to engage community partners to maximize the delivery of best mental health services as well as other services related to wellness and healthy lifestyles. The event, which was held in Abu Dhabi and Dubai campuses for one day, also saw the participation of the Health Authority Abu Dhabi (HAAD), Dubai Health Authority (DHA), Family Development Foundation, Dubai Foundation for Women and Children, the American Center for Psychiatry and Neurology, and Oxford Medical Center within Zayed University. 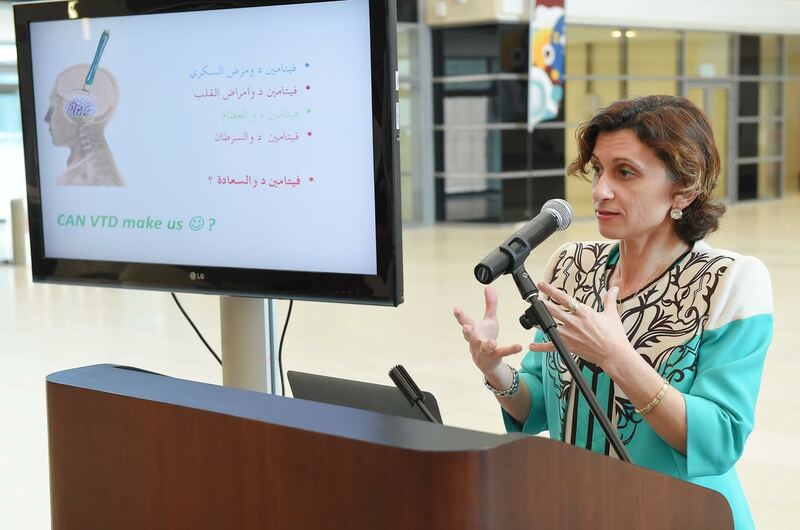 Dr Fatme Al Anouti, Assistant Dean for Students Affairs at the College of Natural and Health Sciences, gave a presentation on vitamin D deficiency among the Emirati population. She also discussed new guidelines, which can be provided to UAE clinicians for the evaluation, treatment, and prevention of vitamin D deficiency. This is considered the first effort ever in the region to propose guidelines that are specific for the UAE population and it is a result of joint collaboration with leading experts at McGill University as well as other universities. The event on both campuses was well attended by students, who appreciated the opportunity to learn more about these topics and interact with professionals. Students shared their experiences relating to mental health issues, which they have observed in their own lives, relationships and families and emphasized the need to stop the stigma associated with it, so everyone can get the help and support they need.